New book, 308 pages. During the Second World War Fritze Kolbe worked as a Foreign Ministry official in Germany. 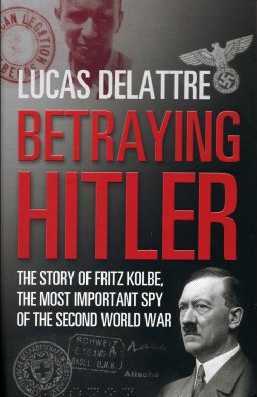 He hated the Nazi regime and in an attempt to aid its demise, he offered to spy for the allied forces. The Americans assigned him the code name 'George Wood' and between 1943 and 1945, at great risk to his life, he smuggled more than 1,600 top secret Nazi documents - from details of military tactics to reports on military tactics to reports on missile developments and plans to deport jews to death camps. Miraculously escaping detection by the Gestapo, he continued to work as an informer until the end of the war, influencing the outcome of a number of conflicts. But when the war ended, Kolbe's efforts were not officially recognised by the Allies. Denied a Visa to the US, he was ostracised by his colleagues at the German Foreign Ministry and branded a traitor. He later moved to Switzerland, dying on obscurity in 1971. His extraordinary story has remained hidden until 2001 when the CIA declassified over 1000 documents detailing Kolbe's exploits, a man declared by CIA director Richard Helms to have 'delivered the most important information ever supplied by an agent working for the Allies'.